It would appear that Twitter is gradually rolling out a new format for emails alerting you when you’ve received new followers. Just a couple of weeks after introducing a new weekly digest email featuring a list of stories shared on Twitter, along with a sampling of the people that shared those stories. The email notification still contains the name, profile picture, bio and follower count, and we’re assuming it will also still let you know if you have other Twitter users in common with your new follower. Usernames have also been removed from the subject of the email, reading simply, “You have a new follower on Twitter,” along with the ‘report spam’ link. The most significant is the complete redesign of the layout, and while it now features a ‘Follow’ button, rather than allow you to follow back users from the comfort of your inbox, it simply launches their Twitter profile. The layout itself is far more sleek, and suddenly makes the older notification emails look quite outdated. 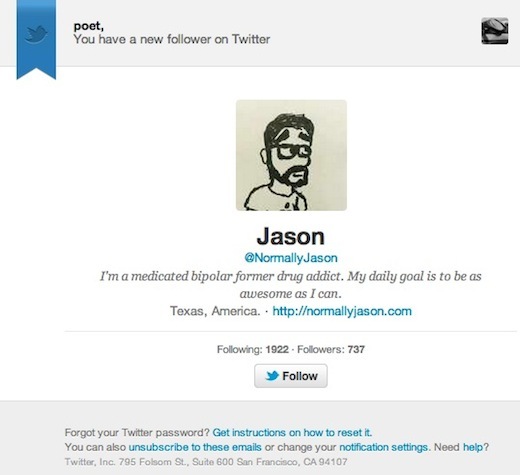 The email also now includes the Twitter user’s website, if they happen to have added one to their profile. What do you think of the new layout? Let us know in the comments.